"We are surprised because the dense gas structure is extended much more than expected in the proto-supercluster," said Dr. Mawatari. "Wider field observations with narrow-band filters are needed to grasp full picture of this largest structure in the young Universe. This is exactly the type of strong research that can be done with Hyper Suprime-Cam (HSC) recently mounted at the Subaru Telescope. We intend to study the gas – galaxy relation in various proto-superclusters using the HSC." Stars assembled to form galaxies, and galaxies are clustered to form larger structures such as clusters or superclusters. Matter in the current universe is structured in a hierarchical manner on scales of ~ 100 million light-years. However, we cannot observe inhomogeneous structure in any direction or distance over scales larger than that. One important issue in modern astronomy is to clarify how perfectly the large-scale uniformity and homogeneity in matter distribution is maintained. In addition, astronomers seek to investigate the properties of the seeds of large-scale structures (i.e., the initial matter fluctuations) that existed at the beginning of the universe. Thus, it is important to observe huge structures at various epochs (which translates to distances). The study of gaseous matter as well as galaxies is needed for an accurate and comprehensive understanding. This is because local superclusters are known to be rich in gas. Furthermore, it is clear that there are many newborn galaxies in ancient (or distant) clusters. A detailed comparison between the spatial distributions of galaxies and gas during the early epochs of the universe is very important to understand process of galaxy formation from the dim (low light-emitting) clumps of gas in the early universe. In order to investigate early, dim gas clouds, astronomers take advantage of the fact that light from bright distant objects gets dimmed by foreground gas (giving an effect like a "shadow picture"). Since neutral hydrogen in the gas cloud absorbs and dims light from background objects at a certain wavelength, we can see characteristic absorption feature in the spectrum of the background object. In many previous observations, researchers used quasars (which are very bright and distant) as background light sources. Because bright quasars are very rare, opportunities for such observations are limited. This allows astronomers to get information about the gas that lies only along the line of sight between a single QSO and Earth in a wide survey area. It has long been the goal to obtain "multi-dimensional" information of gas (e.g., spatially resolve the gas clouds) rather than the "one-dimensional" view currently available. This requires a new approach. The researchers applied their scheme to the Subaru Telescope Suprime-Cam imaging data taken in their previous large survey of galaxies. The fields investigated in this work include the SSA22 field, an ancestor of a supercluster of galaxies (proto-supercluster), where young galaxies are formed actively, in the universe 11.5 billion years ago in the early universe. The researchers' work resulted in very wide-area maps of the neutral hydrogen gas in the three fields studied. It appears that the neutral hydrogen gas absorption is significantly strong over the entire SSA22 proto-supercluster field compared with those in the normal fields (SXDS and GOODS-N). It is clearly confirmed that the proto-supercluster environment is rich in neutral hydrogen gas, which is the major building block of galaxies. The team's work also revealed that gas distribution in the proto-supercluster region does not align with the galaxies' distribution perfectly. While the proto-supercluster is rich in both galaxies and gas, there is no local-scale dependency of gas amount correlated with the density of galaxies inside the proto-supercluster. This result may mean that the neutral hydrogen gas not only is associated with the individual galaxies but also spreads out diffusely across intergalactic space only within the proto-supercluster. Since the neutral hydrogen gas excess in the SSA22 field is detected over the entire searched area, this overdense gas structure is actually extended more than 160 million light-years. In the traditional view of structure formation, matter density fluctuation is thought to be smaller and large-scale high-density structure was rarer in the early universe. The discovery that a gas structure that extends across more than 160 million light-years (which is roughly same as present-day superclusters in scale) already existed in the universe 11.5 billion years ago is a surprising result of this study. 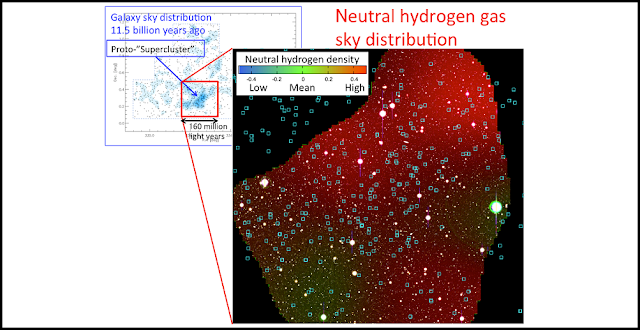 By investigating spatial distribution of the neutral hydrogen gas in a very large area, the researchers have provided a new window on the relation between gas and galaxies in the young universe. The SSA22 huge gas structure revealed by this work is considered a key object to test the standard theory of structure formation, and so further investigation is anticipated. This research will be published in the journal of the British Royal Astronomical Society (Monthly Notices of the Royal Astronomical Society, publisher Oxford University Press) in its June, 2017 issue of the printed version (Mawatari et al. 2017, MNRAS, 467, 3951, "Imaging of diffuse HI absorption structure in the SSA22 protocluster region at z = 3.1"). This work is supported by JSPS Grant-in-Aid JP26287034 and JP16H06713.